You will provide this id to the Calendar constructor later either as a bounding box or a content box. The difference is in html markup generated by YUI3. I'll use a bounding box below in order to manipulate position of calendar window. Here we'll define some variables to be used in functions later and the calendar instance itself. This doesn't fully work in IE - you will loose the currently selected date when you click on the text field again. That's because IE cannot parse dateString into valid JS Date but returns null instead. 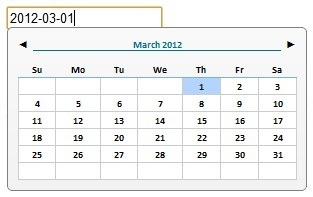 The single instance of Calendar is used on the page. That's why we have to deselect old date, parse date value stored in the text field and select this date in calendar manually. However, you benefit from it when you have many date selection text fields on the page (in my case there are 3 date ranges, thus, 6 date text fields). Check YUI3 Calendar API page for more details. This function simply hides the calendar window from the page. That's it. It works flawlessly in Chrome and Firefox, also quite nice in IE8 except loosing selected date when clicking text fields again. YUI version used is 3.4.1. Hi..same code iam using in yui3 calendar development..its not working..please help me to find.